What's a summary statement and when should you include one on your resume? A resume summary statement is a brief list or few sentences at the top of your resume (after your contact information) that highlights your qualifications for a job. Also known as a summary of qualifications or a resume profile, a summary statement gives the hiring manager, at a glance, a synopsis of your professional qualifications. When writing a resume summary statement, be sure to include concrete information on how you have added value to companies and helped to transform departments or organizations. This will show the hiring manager that you would be an asset at the company. Your summary statement is often the first item read on a resume, so you want to get to the point: why should a company hire you? In about one to four sentences, highlight your most relevant strengths, skillset, and core competencies that are unique to you as a candidate. In particular, demonstrate how you will add value to the company. Have you saved money for a company in the past? Did you streamline an administrative process? Include skills and experiences that will impress the employer. Be sure to tailor your resume summary to the specific job listing. Look at the listing, and try to incorporate keywords from the listing in your resume summary. This will help the employer see how you are a good fit for the job. In a resume summary statement, avoid skills that are commonplace (for example, avoid mentioning Microsoft Office), or overused words (such as "multitasker" or “team player”). Try to use action words to demonstrate your achievements. The summary statement should be approximately two to four lines and speak to your professional background only. Do not address any outstanding circumstances (employment gaps, change of career, personal experiences, etc.). A cover letter is an expanded version of the statement that will allow your personality to shine through. This is a resume example with a summary statement. Download the resume template (compatible with Google Docs and Word Online) or read the example below. Certified Workforce Development Professional / Career Specialist offering experience providing tailored career counseling, coaching, and job seeker services. Work well with clients from all walks of life to identify values, develop possible career paths, and design effective job search strategies. 90% successful employment placement rate. Proficient with database programs including Oracle and Microsoft SQL Server. Promoted to provide career management services to the universal population, assessing job readiness and preparing clients for entry / re-entry into the workforce. Duties include intake, interviewing, eligibility verification, referrals to supportive services and employer services, career coaching, and job search and orientation / classroom instruction. Serve as client liaison with instructors, businesses, and other client resources. Achieved and consistently maintained successful employment placement rate of 90%. Demonstrated strong understanding of labor market, vocational systems, One-Stop services, and One-Stop referral system. Conducted intake interviews and administered screening forms to ascertain client eligibility for public assistance services. Provided initial and follow-up support to clients, scheduled eligibility review dates, and resolved eligibility issues. Meticulously maintained documentation in database and hard copy case files. Provided referrals to community-based partners and agencies. Hand-selected by senior management to serve as Project Support Associate Specialist / Team Leader tasked with providing customized training opportunities for students. There are a number of benefits to including a summary statement in your resume. The main benefit is that it helps your resume stand out. When hiring managers are reading through dozens, even hundreds, of resumes, they often skim through each and miss information. By beginning with a statement that concisely describes why you are qualified, you are more likely to get a closer look. However, just writing a resume summary statement does not guarantee that employers will be interested in your resume. You need to make sure your resume summary statement concisely demonstrates why you are an ideal candidate for the specific job and company. A resume summary is sometimes referred to as an executive summary, especially for upper-level positions. 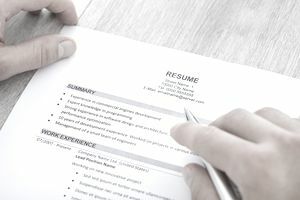 An executive resume summary statement is even more critical for advanced positions since prospective employers will be primarily focusing on and comparing the track record of success that candidates have developed in similar roles. A resume summary statement is not the same as a resume objective. Both are a few sentences long, and are located at the top of one’s resume. However, a resume objective statement tends to focus more on your own interests as the job seeker – it emphasizes what you are looking for in a job or company. A resume summary statement, on the other hand, communicates what you can bring to the table in the targeted role. It is a way to “sell yourself” to the employer. Hands-on executive officer known for strategic and focused approach, with extensive accolades for limiting risk, creating lean teams, and establishing creative strategies for optimizing internal operations, financial returns, external customer service, and output. Multi-faceted, efficient, and reliable administrative professional with 10+ years of experience supporting executives, sales personnel, and managers to improve internal operations for small businesses. Proficient in CRM applications and design programs. Diversified skill set covering administrative support, client relations, writing, human resources and recruiting, account management, and project management. Excellent interpersonal, phone, and digital communication skills. Self-driven, detail-oriented professional leveraging advanced analytical and research talents to excel within an intellectually demanding Paralegal role with an established law firm. Legal Administration: Utilize Paralegal training and proven research and writing skills to ensure the timely drafting and submission of legal documents. Unparalleled grammatical and editing skills. Communications / Client Relations: 10 years' experience working directly with clients from diverse socioeconomic, cultural, and ethnic backgrounds to define individual needs, assemble personal histories / career backgrounds, convey project statuses, and formulate strategic presentations. Easily instill trust and confidence in clients stressed by challenging work environments and life events; handle private client data with 100% confidentiality and integrity. Information Management: Swiftly master and apply business and online technologies and proprietary databases / content management systems. Technical proficiencies include MyCase Legal Practice Management Software, Best Case Bankruptcy Software, and Clio. Key Strengths: Finely-tuned analytical skills with a dedication to expanding subject knowledge and workplace competencies through continuing research and training; willingly assume extra responsibility to ensure optimal and timely project execution. Type 80 wpm with perfect accuracy. 15 years of successful sales management experience within the consumer products industry. Lead by example in motivating sales teams to unprecedented YOY gains. Increased sales in the northeast region by 15% through creative vendor partnerships and instituting sales incentives. Hired, trained, and inspired award-winning sales team, generating profits at 10% above the company average. Conducted customer satisfaction surveys and recommended product enhancements which were then adopted by senior management. Seasoned project manager with 5+ years of print project management experience and knowledge of web production obtained from positions in educational publishing and consumer packaging. Creative problem solver who has consistently completed projects on time and within budget. Employed a customer-focused approach which increased repeat business by 15% over the prior cycle. Reduced employee turnover by 35% and retained all top performing staff members. This list of professionally written resume samples include templates you can download to create your own resume. What Does an IT Technician Resume and Summary Statement Look Like?